I say, open source this puppy. My SMP Server crew depends on this mapper, and we're SOL for now. I understand the realities of life get in the way a lot of times, which is why should all work together! It hasn't stopped, but it was delayed for a couple of months due to school. I'm getting back to fixing things, and an update should be out soon. At this point, it's about time for most of the code to be rewritten/fixed to be more portable, since I want to open the source soon. on windows you use a semicolon to separate path components... try that. :-) Hopefully that will get you sorted. Will this be updated sometime soon? Was wanting to get it up and running for my SMP server. Read the title, it's updated already. Thanks man, now this is quite a surprise and a good one. I will try to deploy it right away and see how it goes. Could not find the main class: main. Program will exit. Many people in this thread have used this with hMod successfully, I think the key was to swap the hmod.jar for minecraft_server.jar in the command line i posted, so TerrainMod will load first, then hMod, which will call into minecraft_server.jar. Is anyone else having issues using subterranean mode? I don;'t mind handing out some wood/sapplings to new players, but was hoping to avoid using the give command if possible. Honestly, i hadn't tested the subterranean stuff before I uploaded it. I'll try to take a look and see if I've messed something up. I'd be happy to upload the code on google code or something... but, with the new changes, I'm not sure what direction to take the mod in. Notch seems to be implementing different trees now, so I don't know if I should stick with that. The biome code is getting much better in the vanilla server, so I'm not sure what changes to make there. What do you guys think. What do you want to see in a new for 1.2 version? Sorry, I held off during the near constant beta updates from notch, then I injured myself, and now it's the holidays. I will get it set up to current release. ]Works in SP. I just copied SMP map to my SP saves. Thanks! 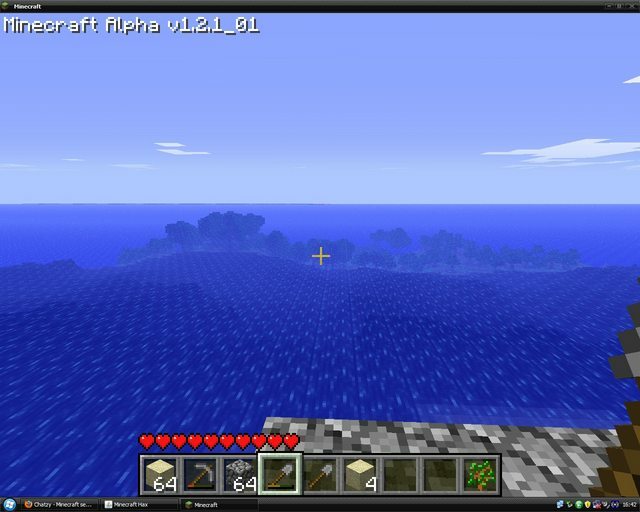 The new chunk uses the default water level, but at this angle, it looks like it's underwater. Pretty funny, but expected. Make sure you have the newest terraintweaker.jar.. Delete your copy and redownload, just to be sure. It looks like you're using an older version. Good luck! I'm still looking into it. It's something with the biome lookups/caching. I can't quite nail down even why it's going wrong, but it's on my list. As is the offset Acacia trees. Work is brutal this week, so it's slow going for now.